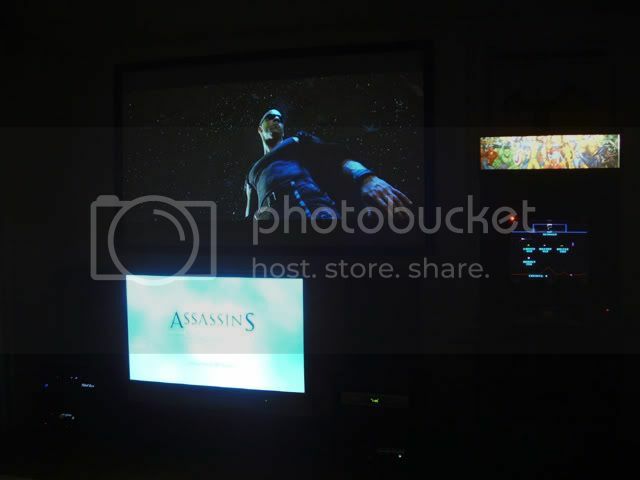 I have the Home Theater setup- a 106" diagonal screen with the Panasonic ax200u projector, and I am working on my arcade. (Every 'Theater needs at least one arcade machine right? ) and when I finish that I'll be getting a pool table... so life is grand! I'm pretty savvy with the internet, and I am a network engineer by profession, so I know my way around computers and electronics. I found that everytime I start a new hobby I always find sites like this after I get started. It's mainly because when you first start you don't know what to look for or sometimes sites are buried in search engines and you may not find them right away. For my first arcade cab I went with the Ultimate Arcade II. As much as many will cringe, I went with their kit. I assessed my wood working skills and tools and knew I would make some major mistakes, and for my first cab I really am more concerned with actual game setup and functionality right now. Eventually I will build my own, especially after finding this site! Okay enough of the introductions. I have to upload my pictures, which I will do this weekend. Here are my comments on their kit. I did a search and read through several pages on the Ultimate Arcade II but mainly saw people building from the plans and not many on the pre-made kit. The kit is expensive compared to buying the plans, but everything is pre-cut and all the parts are there (with the exception of T-molding, more on that later though). My son was up on vacation for two weeks and he was very interested in doing this project with me. In that respect, the UAII kit is a breeze. Assembly is straight forward and very easy. We did it in two evenings, but if you start Saturday morning, you'll be finished by suppertime with no problem at all. Fit and finish is good, all panels go together easily and overall it is sturdy, but not 'rock solid'. That is probably the biggest thing to consider. Since it will primarily be my wife and I that use it, we won't be shaking it to death, but if you are an aggressive player, or if you know a bunch of kids will be using it, I would add extra supports. The problem is it uses LPL press board. I have lots of MDF laying around that I have used for other projects and this definitely isn't MDF from what I see on the edges. That doesn't mean this is bad, but there are some potential problems that I'll mention. The biggest problem I see and already mentioned is it needs some extra bracing and support. EVERYTHING is secured together with Sauder style fasteners. That a lot of weight depending on just a few cam fasteners. The bottom isn't a problem unless you want to mount wheels, and if you ever want to move this after it's finished and has a 27" monitor, cp, speakers, PC and full electronics you'll wish you put wheels on! Here's where one of the biggest structural problems comes into play. The entire cab is supported by the lower assembly side panels. The bottom panel is actually slightly recessed and isn't flush with the side panels. This is actually nice if you want to put low profile appliance casters on the cab like I did. You won't even see the wheels! The problem is that now all the weight is supported by eight cams and eight cam pins. It is easy enough to add a bracing frame inside to prevent the cam pins from ripping out of the press board under the stress and weight. The other way they could have constructed this was to have the bottom panel go the entire width of the cabinet and then the sides would sit on the bottom and you could attach wheels to it without any worries. The monitor shelf area could use a little extra bracing in my opinion too, but it's not as much of a problem as the bottom panel and adding wheels. Now for the back. I personally think this is a cool looking cab for something so easy to make, but for all the fit and finish the rest of the UAII has, the back is lacking a professional look. I will concede that there are some tough angles that they had to contend with, but the back panels have gaps that are clearly visible and then when you throw in that the edges of the press board show in these areas... it looks pretty bad. I saw one person comment that the back panels connect from the inside, and for all but the main back panel that's true. They really aren't hard to get to and screw in though. I would have liked to have had a door on the back rather than a panel I have to screw and unscrew anytime I want access. It's not only just the added PITA aspect, but over time I can see the pressboard rounding out in the screw areas and then the screws will be loose or not hold at all. The Keyboard drawer is simplistic and functional, but if you plan on doing any lengthy configurations that require the keyboard, it can be awkward to use for lengthy periods. My knee was blown out at the time and I had to sit in a chair and accessing the keyboard was absolutely miserable. This is where a hinged front on the drawer would have really been nice. All in all though, it's only a minor issue since we won't be using a keyboard all that often. I am not knocking Mameroom at all. Overall I am very happy with the UAII kit, but it isn't perfect. (Is anything?) It could however be improved... but one thing that was lacking for a kit that costs $500 is T-molding! At a minimum they should have supplied at least the standard black and then sold the other colors as an option (although I see no reason why a person couldn't specify a different color if they wanted it). Their pricing on T-molding is extremely reasonable and competitive. In fact it was the least expensive of anyplace I checked. They have all the basic colors, but if you want something fancy you'll have to look elsewhere. All the T-Molding slots were clean and centered perfectly. There was only on spot that had some minor debris that I had to use a screw driver to remove. It took me all of twenty minutes (probably less actually) to put the T-Molding on, and this was after the cabinet was fully assembled. The reason why I put it on after assembly... For whatever reason, I assumed black T-molding was included and it was not. Since this was a father/son project and we had limited time to do this, we went ahead and put the cabinet together and I ordered the T-molding. It wasn't the worse shipping I ever dealt with, but it wasn't the fastest either. I ordered early in the week hoping to get it by the weekend, but even though the order was processed, it wasn't shipped for a couple of days, which threw the delivery off until the following week. Other than that, this is a very nice cabinet that is super easy to construct and reasonably solid. Anyone with basic tools can assemble this with ease. From start to game play... two evenings! Now I already had my MAME PC setup, and to ensure we would be able to play before my son had to go home to PA, I also ordered a TankStick. Once the cabinet was together, we just put everything inside and fired it up! As I said, I will be adding pictures this weekend. I still have to do the extra frame bracing that I mentioned but it's up and my wife and I play it all the time while I am designing the final CP and I add the artwork. Save yourself some money on the retainers. I used some clear plastic corner trim that was something like $2 at Home Depot. I sprayed it black and screwed it down and it works perfectly. As far as the marquee plexi, Mameroom charges $10 for it pre-cut to the right size. If you're worried about cutting plexi without cracking it, the $10 isn't bad. Otherwise I just used some thin plexi I had and cut it myself. Nice writeup - I look forward to seeing the pictures of your build. What about the software end of things? Are you planning on multiple emulators, and what front end are you considering to launch the games? Right now I am using MAMEUI32. Keep in mind I started this project before finding this site! I probably would have gone a different route if I had known about this site first. Definitely putting a link to it on the forum where I moderate for home theater stuff! My son wants me to add an Xbox to it, and I already have a PS3 and Dreamcast, so yeah down the road I probably will try to integrate those as well. I'm still looking at front ends and haven't decided on one yet. To be honest, at this point I haven't played around with too many enough to make a decision. There is no reason to show a step by step of the build, it really is that straight forward and easy. Here is the lower section on its side with the bottom panel installed. I don't know if you can make it out in the picture, but the bottom panel isn't flush with the bottom of the sides. Also shown are the appliance casters I used. No fear of these not being able to support the weight- they are designed to put under refrigerators/freezers so you can move them around more easily. No MAME or arcade cabinet that I know of would exceed the weight capacity of these. I like them because of their strength and they are very low profile. Here are the casters mounted on the bottom panel. Lower Cab finished with casters installed and standing up. It rolls around easily but you can't see the wheels and they only add less than a 1/4" to the height. One thing to note about the UAII speaker panel- They cut out curved slots and although it somewhat looks like a 'grill' there is a lot of wood still there. Still, in the end it sounds much better than I expected. Second note, the 'grill area' isn't black on the inside where they made the cuts. You'll definitely want to paint them black or they will look terrible. Here's an inside shot from the back of the cabinet of the speaker panel and light installed. For the light I had a 20" fluorescent light that I also had laying around brand new and never used. They are pretty cheap though at Walmart. I think new it costs $10 or less. 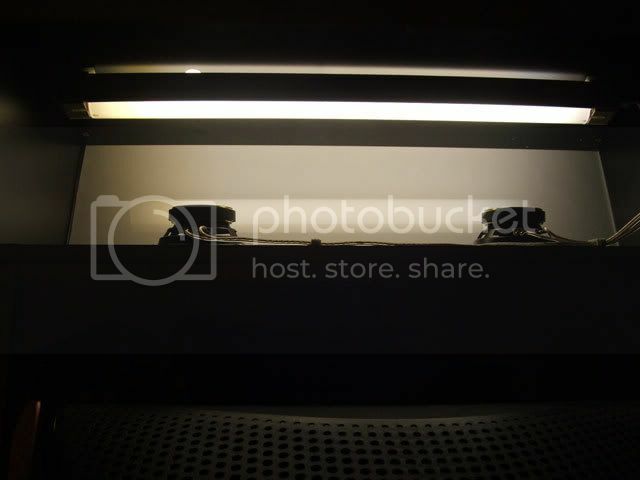 Just use the included paper template for the mounts, screw them in then snap the light in place. 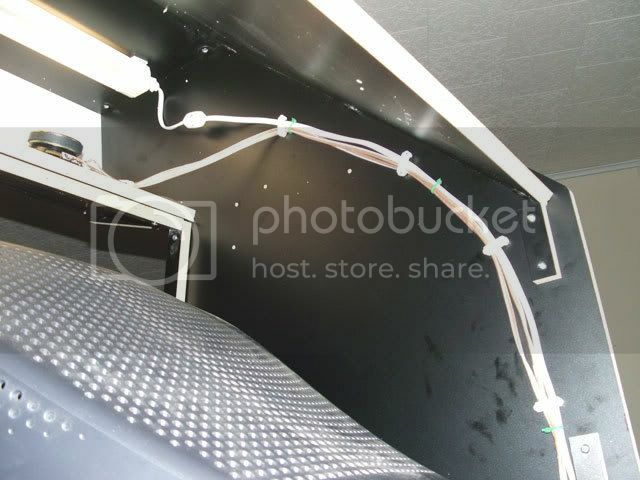 Here is the wiring run for the marquee lighting and speakers. Yes, I know... power and speaker wires in the same run... 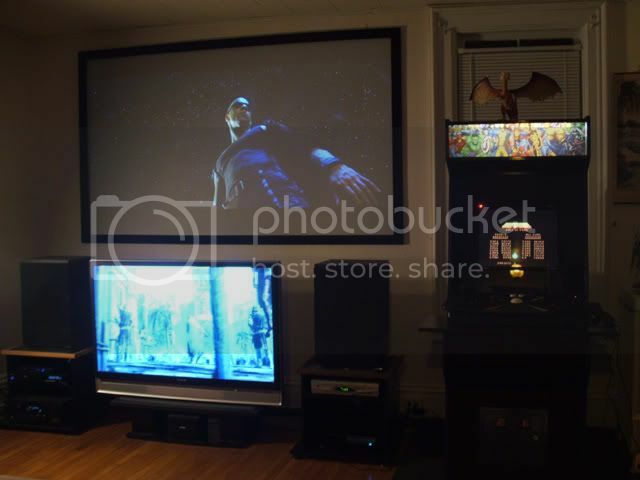 I would never do this for a home theater install, but I wasn't as concerned about fidelity here. If I ran into a 60hz buzz in the speakers I would have moved them to the other side of the cab. Last picture for now. I decided I did not want a permanent power cord coming out of the back of my console. What I did was I got a switch/outlet combo. I wired it so that the switch turns on and off the power from the outlet. I made a power cable with two male ends, one for the wall outlet and the other plugs into the switched outlet. On the inside (and I'll take more pictures of that) I used a good surge suppressor warrantied up to $10,000 of equipment protection. I cut the plug off and wired that to my 'on/off switch'. Now I just flip the switch and the cab has power. I haven't decided whether I want to make a relay to also turn the PC on, or just relocate the PC power button to some inconspicuous location on the console. Other than the wheels and power switch addition, the rest is all stock kit. I will be adding some braces on the bottom to support the weight better though. I'll get the pictures of the top and bottom together as well as with the T-Molding in place. This isn't anything super fancy or anything like that, just showing the build of an Ultimate Arcade II is all. Here are some shots of the completed cabinet up an running with the TankStick. This is just a semi-temporary control panel because I am planning on building a custom modular panel. For now it works great and lets us play games while I work on the main control panels. Here is a shot of the keyboard drawer. And one of the TankStick. Since I knew this was going to be a temp setup, I made a shelf out of MDF and painted it black and put satin poly on it. It looks a lot better than the raw rough looking MDF and actually this is rather nice because it also allows us to have a spot to put soda's on! Here is a shot of the Marquee. It looks better than in the picture. This isn't anything fancy or thought out, I just wanted some artwork up while I decide on the final look. This is a Marvel super hero poster that I just trimmed and put behind some pexi. A shot of the Defender game screen. Here are a couple looking from the hallway door into the room with everything on! 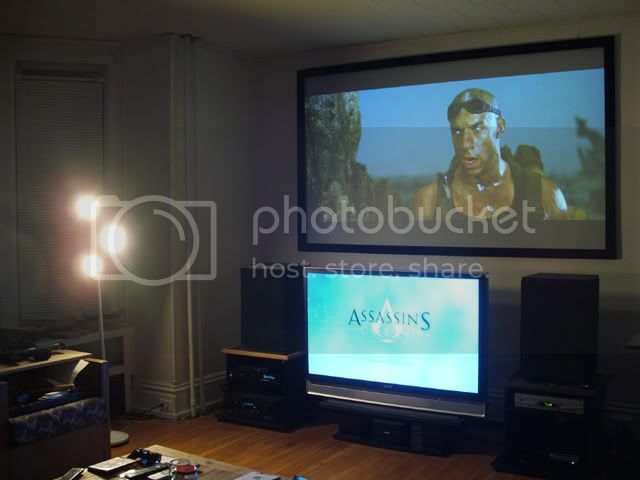 Chronical's of Riddick is on the projector, Assassin's Creed is on the SXRD from the PS3, and then the Arcade in the corner! First is all lights on, which include three 60W bulbs off to the left of the screen and a 60W lamp in the adjacent corner of the room. The next shot is with lights out. This should give anyone interested the amount of light we're talking about and it's location to the screen. And then some of the other 'toys' I have to rig up to the arcade for the modular panel. This one is kinda interesting... It's not a real coin door but a printed sticker! It looks real until you get up close to it and is a nice, yet easy finishing touch. 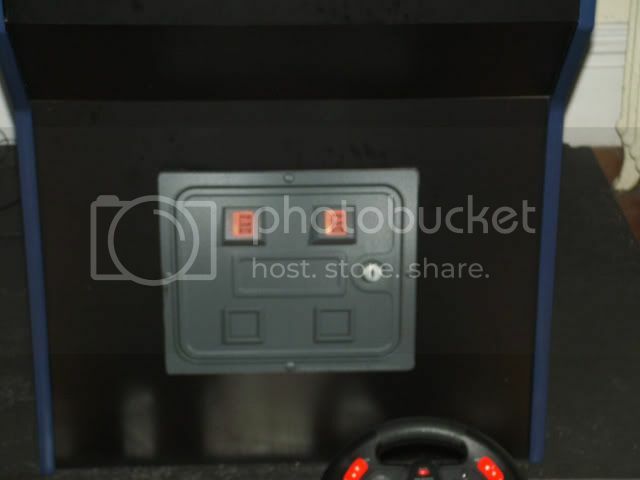 I plan on getting a real coin door though but for a different reason- I plan on converting the coin slot push buttons into on/off switches for the computer and sound system. That's a bit overkill though for some, so I wanted to show how good this printed decal looks. I'm definitely not done but it's up and fully functional with any joystick, button, or trackball game! Soon I'll add more features but the beauty is I can add on as I want. 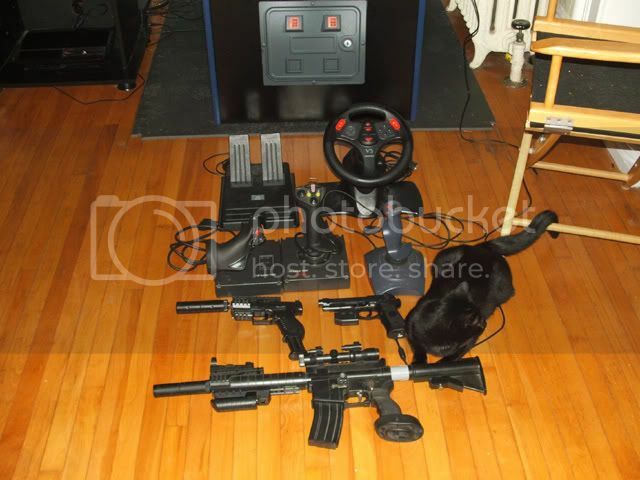 $540 for the Ultimate Arcade cabinet (very easy and nice). If your good at wood working and have the tools already then you can build your own cabinet for a fraction of that price. $20 for the plexi bezel and marquee plexi. $14 for the car speakers I used. For a total of $824. Round up for some screws and other miscellaneous items, $840. Like I said, some people may be able to trim an extra couple hundred off the price by making their own cabinet, and maybe another $50 for the control panel(or the cp could cost more, depending on what a person wants). The rest are all spare parts and an old computer just laying around collecting dust. This will jump in price though because I plan on replacing the 21" Trinitron PC monitor with a 27" monitor. That will raise the price by another $500. If you don't plan on playing any computer games, you can get away with a 27" TV which will lower the price as well as open up a ton of options for light guns! May seem like a lot of money to some people, but this is one cool addition to our multi-purpose 'theater'. 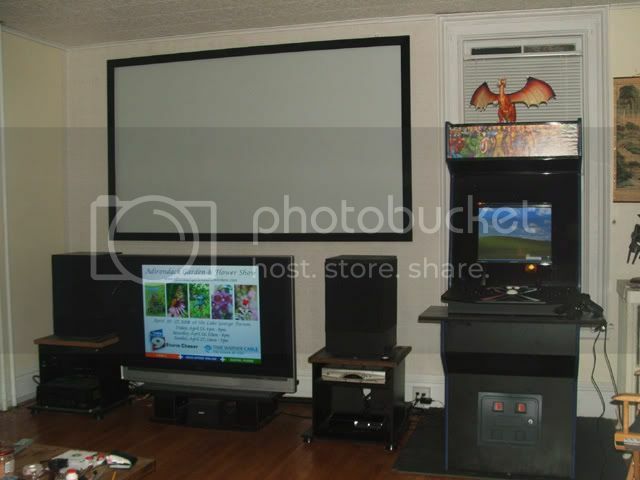 In a year or two I plan on building an addition to the house for a dedicated Home Theater and I plan on having a 'lobby' room and I will probably have a couple of arcade systems in that area. My son and I did most of the work as a father/son project when he was up on vacation and that was a lot of fun to do with him. He invited a couple of friends over and they were flipping out! :) And that was before the T-molding and some of the temporary details were done. All in all I am very pleased with this project. I was debating on whether to do this or build an HTPC and I really couldn't justify the HTPC. It wouldn't really add anything to my setup and room... I already have an HD DVR, Bluray and HD DVD players, as well as around a TB of hard drives connected to my PS3 for DVD archive playback. I'm glad I decided on the Arcade project and hope it sparked some interest in others out there. My grandson (who is my buddy!) has been playing MAME games upstairs when he comes to visit and he thinks it's the coolest thing in the world, and that was just on the PC. He said it was just like being at Chucky Cheese... well I have a huge surprise for him the next time he comes to visit! 5 Stars For ease of construction, especially if you go with a cabinet kit. 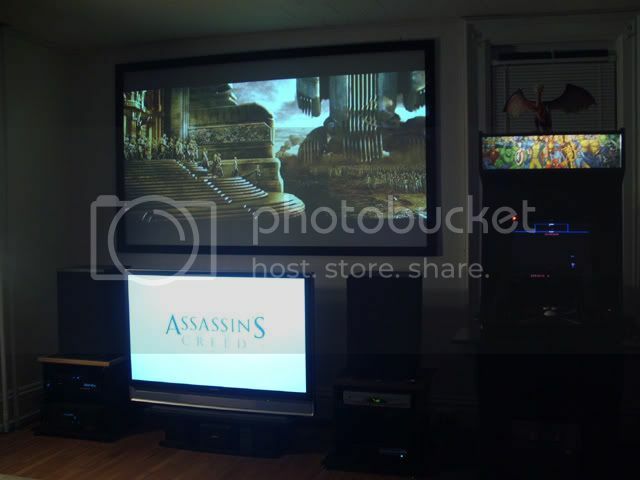 Very nice entertainment setup! Wife knows that I want a similar setup but I can only get a room for myself when we move to a bigger house. I lucked out and we found a big ole Victorian house that has two living rooms, kitchen, and dining room. The wife owns the kitchen and dining room, and I have run of the living rooms! She decorates her rooms how she likes and my rooms are mine to do with as I want as long as it's nothing crazy! The adjacent living room will ultimately have a pool table and maybe a second arcade machine in there. Where'd you find the image for the coinbox? I found a decent shot at happ controls, but it's a little small. Yours looks very clear in the photos. Where did you get your casters? Coin door decal was from groovygame gear and the appliance casters were from Home Depot. Someone in another thread brough up a good point, these may not work well on carpet. We have hardwood floors throughout the house and I never thought about carpet. According the the UAII instructions (available on the mameroom site) the Marquee should be 27 x 7-7/16 inches. Thanks for putting this review together. This was very helpful to me. 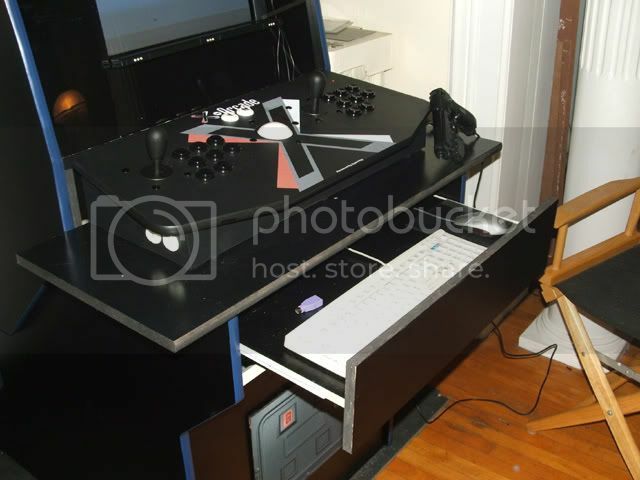 I've got a similar setup but am using the Xarcade XXL Stick - http://www.xgaming.com/mame-panel.shtml. 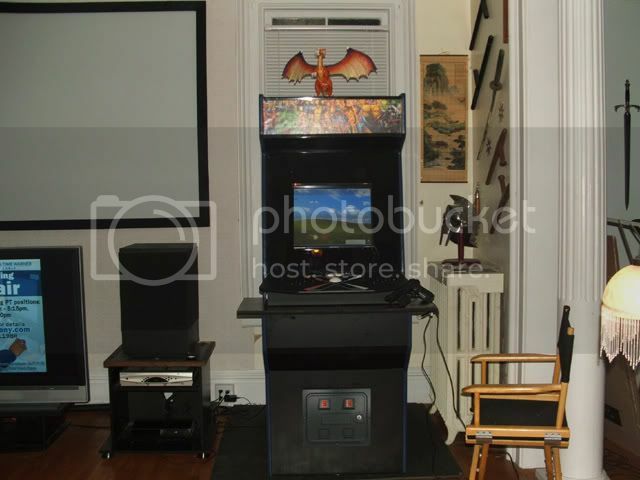 Love the room/arcade setup overall man--very nice! just started my UA2 cab install, and has been pretty easy so far... the plexi for the marquee was a tad to big, so i dremeled it a bit and it fits now... the retainers i didnt use as well, as they would of covered up my bottom portion of my marquee and screwed up my "orange theme" flow of the cab. Ill have some pics up soon. Yea, the cams are pretty goofy, but its pretty easy to install. If I ever have to move this thing, i see it as a positive that I can just seperate the top from the bottom. Those guns you have there, are they working light guns and if so where can I find some? The Beretta 92 (LCD TopGun) is the only light gun at the moment. 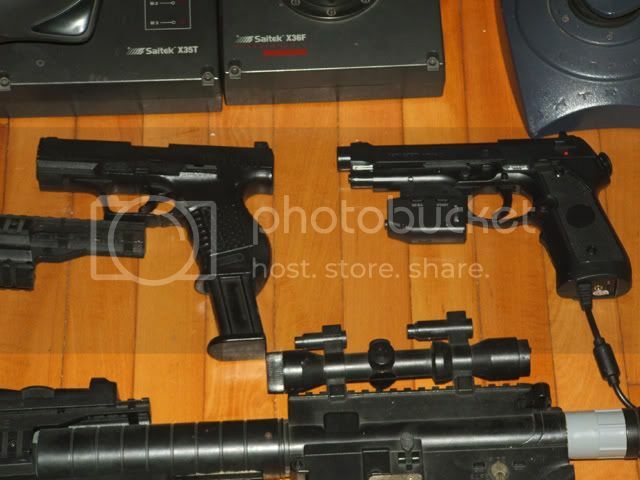 The others are airsoft guns I am converting to light guns. 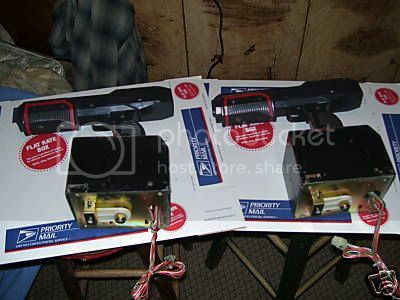 I recently got another M4A1, a Desert Eagle, a PS90 (Stargate machinegun) and I have an MP5 Navy Seal version coming. what size plexi or lexan do i need to fit the bezel area? 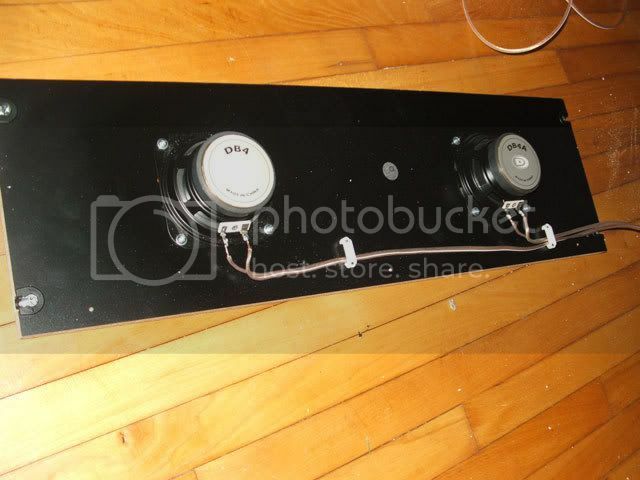 Just snagged this for my cab! I'll have better pics once I get it and clean it up. BTW, my UAII came with black T-molding, so maybe they just forgot to include it in your package. I like the refrigerator caster idea. But for most floors, I would guess that simple furniture skids ( 1.5" plastic disks that nail into the bottom) are sufficient for sliding it around. For pulling the cabinet, I actually built a rope with handles on the end that wraps around the bottom of the cabinet, so I can get a good grip for pulling it out of its corner. 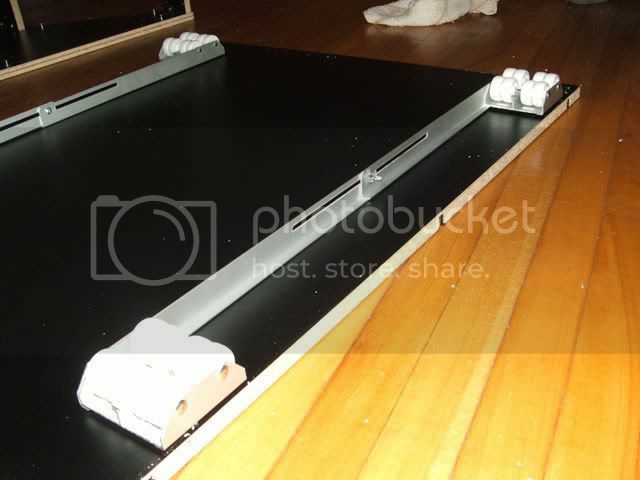 Also, you can put those disks under the sides that touch the floor where the weight is supported without risking putting weight on the bottom board that attaches to the sides but doesn't hold the weight. It would be interesting to see if others also got T-molding in their kits. How long ago did you get yours, maybe they started including it because I know some people were complaining. After not getting it in my kit, I did go to their site and there it was, smaller lettering, but it clearly stated that the T-molding and plexi were not included. For $500 I would have thought they would have thrown in the T-molding at least. The plexi is easy to get at Lowes or Home Depot. 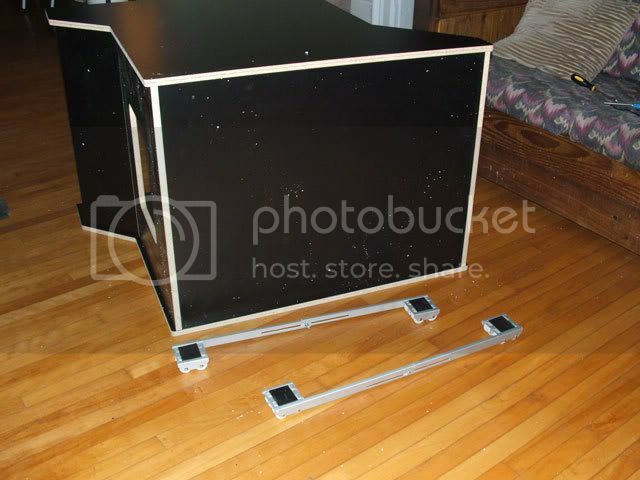 The furniture skids would be a good idea for people with hardwood floors like myself, except the bottom panel isn't flush with the edges and the skids probably wouldn't be thick enough to reach the floor. That is one design change I would make... make the bottom go all the way to the edges of the side panels, or beef up the mounting of the bottom panel for the sole purpose of those that want to put wheels on it. Jason those are great threads! I see you are also using a 21" Dell PC monitor, how do you like it? I see you raised yours up some, while I let mine sit on the UA II monitor shelf. Originally my thoughts were it was way too small for the size cab and especially that huge monitor opening. Now that I have been using it for awhile it doesn't seem too small at all... but still there is always that nagging desire and question 'Should I move up to a 27" display'? Are you still using the Dell or did you go to something else? One really nice thing about the Dell (mine at least) is it has two PC inputs if I were to ever have a need to hook up a secondary system... but most important is it powers on automatically when the cab power is turned on. The new PC I will be putting in the cab also has a power on when power is applied bios feature... so once I swap PCs everything will turn on when I hit the switch in the back, and with no funky mods either! Wow great thread. 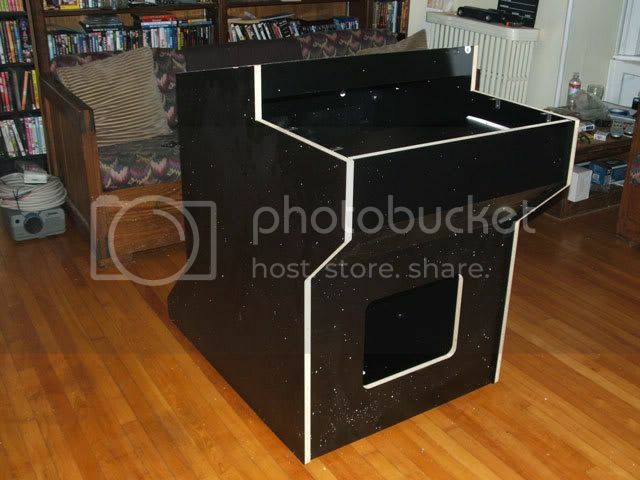 I bought my Ultimate Arcade II cabinet a little over a year ago.. it has sat empty since putting it together. I put in a real happs 4 player coin door and I filled in the blank 2-player control panel that came with it and that's about it. Anyways all this time it's just been a really nice shelf for junk. The reason it has sat empty is because I've been waiting for a time that I could afford a 27" arcade monitor of either the Betson Imperial or Wells Gardner D2900 variety. Anyways I ran into a few snags of not only not having the money, but also the kit I bought did not come with arcade monitor mounts... I ended up buying the mounting kit from mamerooms.. and the plans for drilling the holes.. but never got around to messing with it.. I bought this kit so I didn't have to drill holes and all that. So nothing ever became of that..
Cut to now.. I've finally got everything ordered and ready to go (cept for side art). I decided to go with a 28" Hanns G LCD monitor from Newegg http://www.newegg.com/Product/Product.aspx?Item=N82E16824254026&Tpk=Hanns%2028%22 It's huge and it fits perfectly in the cabinet. 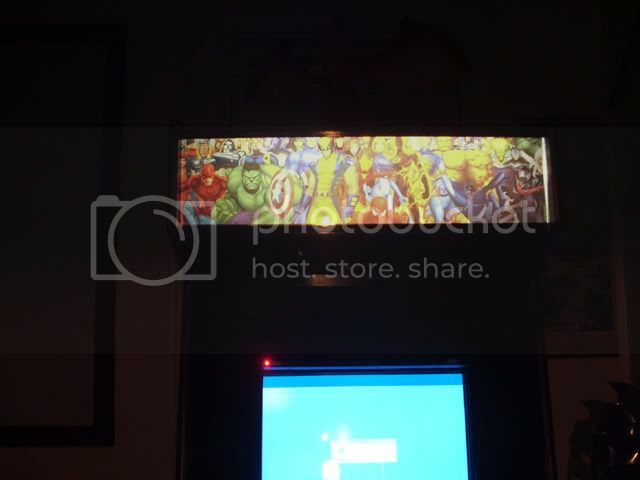 It pained me at first to buy an LCD over a TRUE arcade monitor.. but with dreams of Street Fighter IV coming to the Xbox 360.. an HD monitor is going to be nice to have. (they use hd lcd on the new SF4 machines as well) So yeah it looks NICE in the cabinet... It's also got a great response time for games I highly recommend it if you're going the LCD route. So now I've got the tinted bezel, marquee, two hacked Xbox 360 controllers (thx to HarumaN), and some push buttons and mag stiks (Ultimarc) on the way. After I get all that setup my cabinet will FINALLY be ready to play. The only thing major I have left.. ok well two things is.. I need a PC...I'm going to be using the Xbox 360 arcade games for now. And I'm going to later go with a 4 player panel. But to finally be able to play on this has me excited. Street Fighter II HD Remix comes out on the 26th so that'll be great, I should be finished by then. I will certainly post pictures and maybe video of it running. 1. Control panel mount is flimsy as somebody else mentioned. 3. 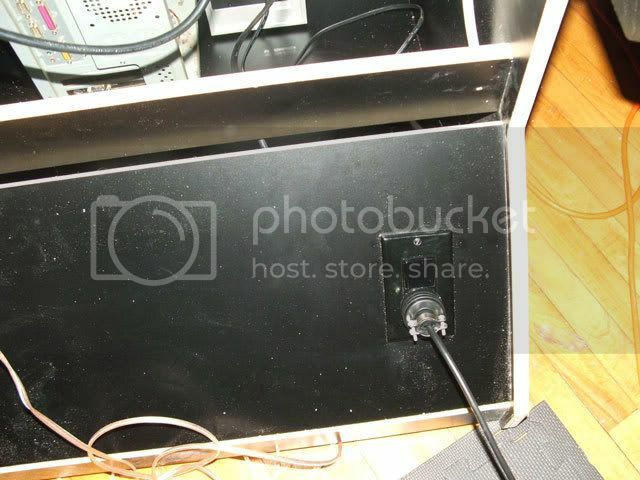 Keyboard drawer gets stuck under CP.. I need to add a handle for it. Also it is uncomftrable to use the keyboard in it. It is TOO DEEP. 4. The lines of the cabinet are strange and the cabinet is HUGE length wise... it sticks too far out from a wall. It's still a nice looking cabinet.. but I would rather had a rectangled back so it would go up against a wall flush. I think that about does it for my complaints.. overall it's pretty damn spiffy. 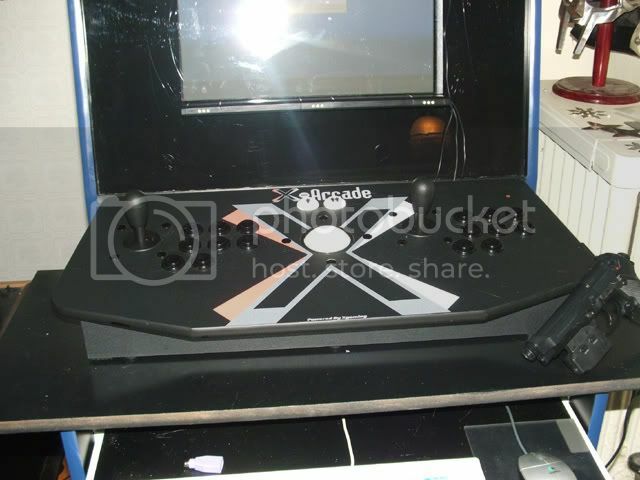 I bought mine off Ebay new from Mamerooms .. didn't go through Scotts website.. and it came with enough t-molding to do the cabinet and the blank 2 player panel it came with. You mean the up/down depth, right? I've always thought that would be an inconvenience and wondered why the design was such. I've always wondered about this, too. Would be even worse with my design, unless I put the mech up top like in the candys. Mine would have been a junk shelf too if I didn't go with an XArcade TankStick and waited until I built my 'ultimate cp'! I know a lot of people don't like XArcade but it isn't that bad and definitely gets you up and running while you sort things out. I think a lot of people lose interest if it takes a long time before they can even play. This way I can play and collect everything I need for my 'modular/swappable' cp system. The TankStick will go to my son, who is chomping at the bit to get his hands on it! Eventually he'll probably build his own cp as well, but the TankStick definitely works, is fun, and gets you going in a snap! I have a 22" Dell Trinitron in there right now. 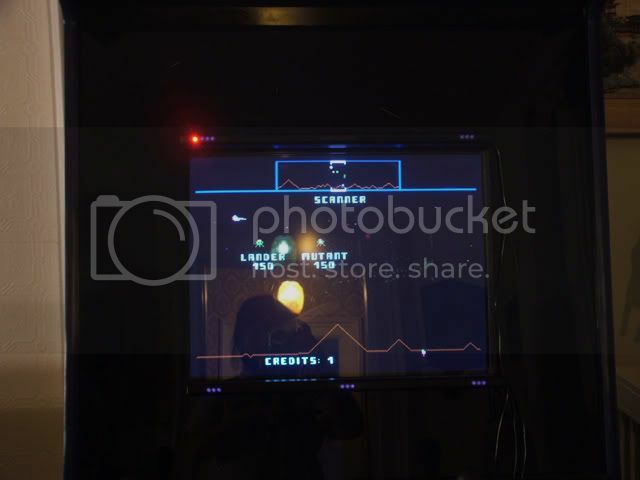 I too was looking at a 27" multi sync arcade monitor, but now I think I will be going with an LCD setup. I've really debated on this one and mainly was waiting for Foley's gun interface to come out, and then he came out with a sonic version that will work with any type of display... as well as the EMS Topgun guys lifted a design... er I mean came out with a new wireless RF gun that works with any display... so looks like LCD for me! One nice thing though is I can store my extra panels in the bottom and now also in the top behind the LCD display! That's a lot of room once you aren't filling it with a big CRT! I'll check into one of these... how much did it set you back? This is a pain, I agree. Mine doesn't get stuck, but with no handle it's not easy to get open sometimes. And yes... it would have been nice if the front of the drawer was hinged and flipped down! That's killer on your wrists if you are using the keyboard for more than a minute or two. It is a big cab. I rather like the back because I leave it out from the wall just a little and with the design it's really easy to get to the back of the cab, and as I mentioned I'll be storing swappable panels in there. I was a bit disappointed about the T-molding. I swear when I bought mine there wasn't anything saying it wasn't included, but Scott was quick at sending me out Black and Dark Blue and I think I have enough to do four cabs! Glad to hear you're back on track and thanks for the monitor tip! Make sure to take lotsa pictures and be a proud papa and show it to us all when you're done! Make sure to take lotsa pictures and be a proud papa and show it to us all when you're done! Smiley"
just wanted to say my cab is holding strong still..
You and I are very much alike. Until then I'm in the process of configuring my FE with all my emulators. I'm sure you've visited the avs forums, but those are some of my favorite forums as well as home theaters go.